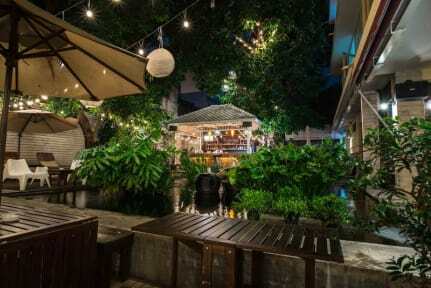 Welcome to a pleasant sanctuary in the heart of Old Bangkok Area. The best heritages stop where you can rediscover the old Bangkok within walking distance. Feung Nakorn Balcony situated on Fuang Nakhon Road, one of the first 3 roads in Bangkok. From the past until today this charming classic Bangkok road remains unchanged, perfect for travelers searching for a nostalgic experience in old Bangkok. 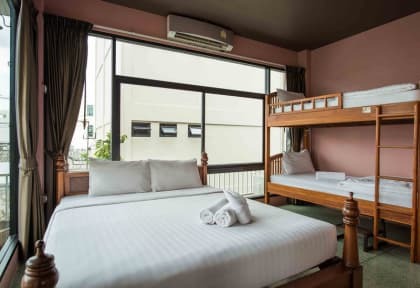 We just a few steps away from many major historical attractions, Grand Palace (15 min walk), Wat Pho- Reclining Buddha (10 min walk), and Wat Arun (temple of dawn). 4 stories building, which has been converted from a local elementary school, retains many of its classic structure and design. Here you will find a main lobby, cozy open-air restaurant, the peaceful landscape outdoor garden, and the chill out bar by a lively Koi fish pond. Here we offer variety room type to suite all your needs. Best place to stay! Everything is awesome about this place! Our stay was fantastic. The room (3 bed private), was spacious and clean, with a good ensuite. The hostel’s facilities are very good, from the breakfast selection to the staff. The breakfast is typically toast and fruits, with some Rice w/eggs, as well as scrambled eggs, which was nice. The location is good, about a 15 minute walk max in either direction to visit Khao San Road or the Tourist sites. There was little to no noise at night as well. I’d definitely stay there again. Perfect for our stay after a long flight, the room was clean and well air conditioned. The location is great for sightseeing in the old town. The staff were so welcoming and spoke really good English. They helped me with recommendations of places to go and eat and visit and how to get there. I would definitely recommend this place to any friends visiting. The bed was super comfy and the room was really clean when I arrived. Very pleasant. And also within good walking range to the grand palace and wat pho. Beautiful "secret garden" tucked away in downtown Bangkok. Not too far from temples (Wat's) or Koh San Road. Great staff. Decent restaurant. Bar was not open while we were there. Staff was excellent. Room was spotless and comfortable. Great value for the money. I would recommend this place to my friends! Our stay was very good. the place was clean , the staff were nice and courteous. I love most the fruits served every breakfast. It was worth the money spent. This hostel felt more like a motel with dorm rooms, which is fine. It was clean and comfortable, the free breakfast was well above average and the location is great for walking to most major attractions. It is a quiet place, not for the partiers. When I was there, the average guest age was closer to 40. The restaurant is good if a bit expensive. Staff are helpful and easygoing. The 24 hour security is usually a guy sleeping near the main entrance, which is almost hidden from the street. Very clean rooms and nice hostel overall. Its not a party hostel or a place where you meet people but the staff is very friendly and the free breakfast is pretty good. 15-20 min walk to Khosan road and the grand palace is a 7 min walk. Great air conditioning. Great facilities.